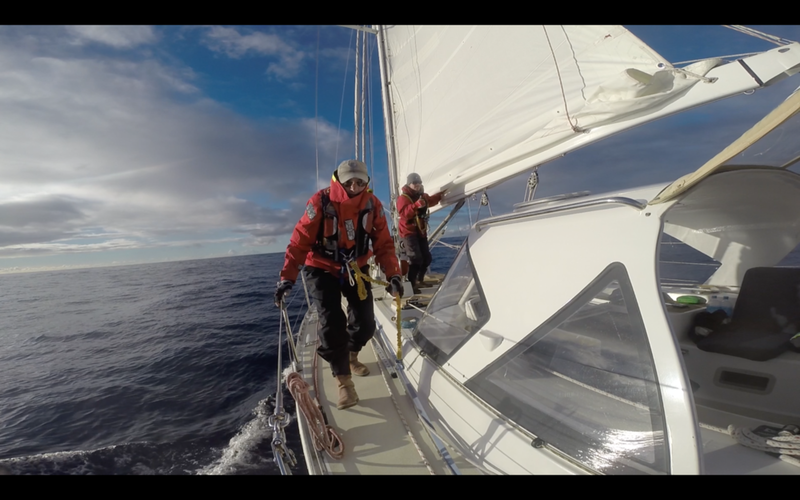 It's old news at this point, but here is a brief account of our sail from Fiji to New Zealand in November. 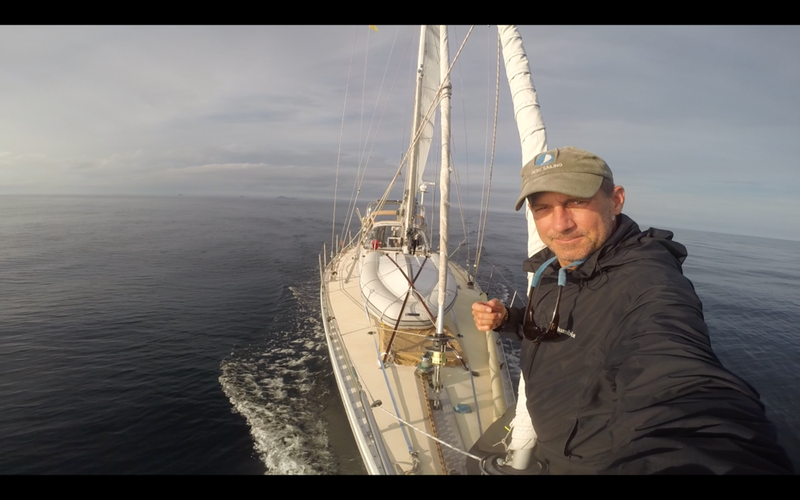 For the fourth time, I joined as crew of the sailing vessel Avalon for her 1,200-mile passage between New Zealand and Fiji. This brings my total ocean sailing miles to over 5,000! This most recent trip began in Port Denerau, Fiji on October 21 when I flew in from San Francisco to meet skipper Tom, his wife Di, and new crew member Nicky. We spent about a week cleaning and organizing, planning and preparing. 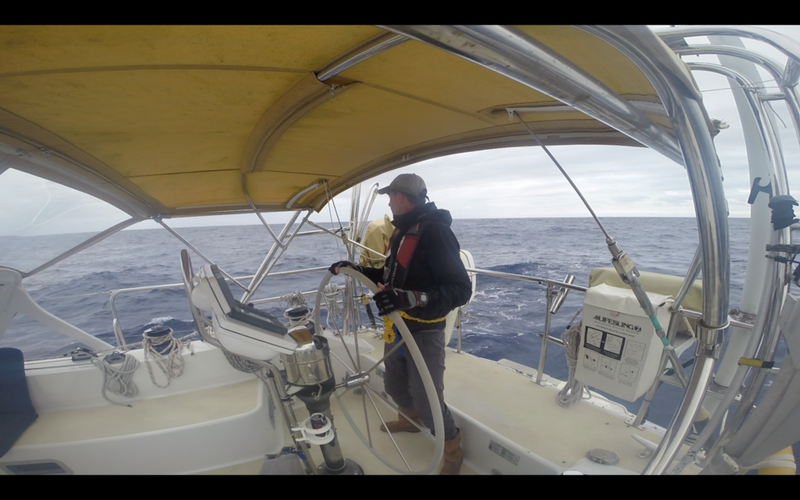 We took a “shakedown sail” one day to re-familiarize ourselves with the boat operations and to test different systems and procedures, like water-making and reefing. We watched the weather diligently, and skipper Tom leveraged many resources to pick a safe weather window for our departure. Sailing across the ocean is not to be taken lightly, especially in this part of the South Pacific Ocean where low pressure systems spin out of the Tasman Sea on a near-regular basis, bringing with them potential for high winds and turbulent seas. During our downtime, we enjoyed dockside lunches at Rhum-ba and sunset beers at Traveller’s beach resort. I stayed at budget hotels most of the week, but the last two nights before departure I splurged and stayed at the Westin. 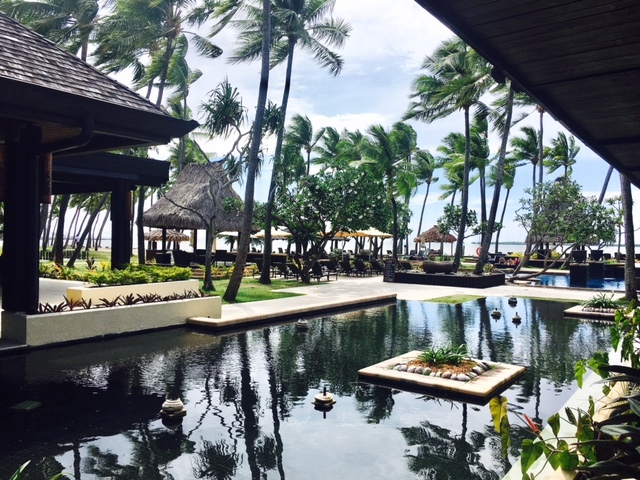 With a favorable weather window materializing, we checked out of Fiji on Saturday, October 28. The wind was coming out of the east, and was forecasted to back around to the north, northwest, and eventually southwest over the next week or so. This rotation worked pretty well for our journey south, although the wind speed was a bit higher than we would have liked (20-25 knots instead of 15-20 knots). The sea state, too, was likely to be a bit bigger than ideal. But, the conditions were satisfactory and the skipper made the call: We cast off the dock lines and set sail! Per Avalon tradition, we departed to the tune of a carefully selected departure soundtrack, which included a number of relevant and/or motivational tracks (e.g., “Should I Stay or Should I Go,” "Help," etc. ), and always ending with “Avalon” by Roxy Music. As we motored out of Port Denerau, a big squall formed behind us but we were able to outrun it even as we slowed down a bit to hoist the sails. We hoped this was a good omen for things to come. Based on multiple weather resources we used for routing, we chose a course slightly south southwest, to stay clear of some heavy weather that was directly south of Fiji. This gentle curve worked out pretty well to avoid the bad stuff. We had a fresh to strong breeze on our beam, which enabled us to keep our speed up as we sliced through the 2-3 meter swells (also on our beam). As expected, we nervously skirted around – and sometimes through – the occasional squall in the early or later evenings. The squalls are tricky, with strong and shifty winds, and frequently thick rain. For the most part, we lucked out. On the bright side, literally, we enjoyed several nights of great moonlight, as our passage happened to include the full moon phase. On some nights, the moon set well before sunrise, so we also enjoyed a couple of crystal clear, starry nights. The first 5 or 6 days of the passage were pretty intense. Wind, swells, squalls. We sailed a lot. We only turned on the auxiliary engine to charge batteries. I don’t think we used the main engine at all (other than our initial departure from the marina). We kept our meals simple, sticking to pre-made sandwiches and pre-cooked / frozen meat pies and lasagna. To fend off seasickness, we constantly drank water and nibbled on snacks. We doubled up on watches – two people at a time – given the relatively intense conditions. Even if we used auto-pilot, we had two people up at night. One person to watch auto-pilot, and a second person to watch the first person. Typically the watches were 3 hours on, 3 hours off, but we varied this a bit depending on the conditions and time of day (night vs. day). Finally, “Land ho!” Toward the end of the passage, day 7 and day 8, the wind died down and we turned on the main engine to propel us down the New Zealand coast. We had been under weather advisory to arrive before the 6th or 7th of November due to another front moving in from the Tasman Sea that would hit New Zealand hard with wind and rain. Skipper Tom timed our arrival perfectly – the evening of November 5 – after encountering oru welcome committee of a pod of dolphins surfing our bow wake. 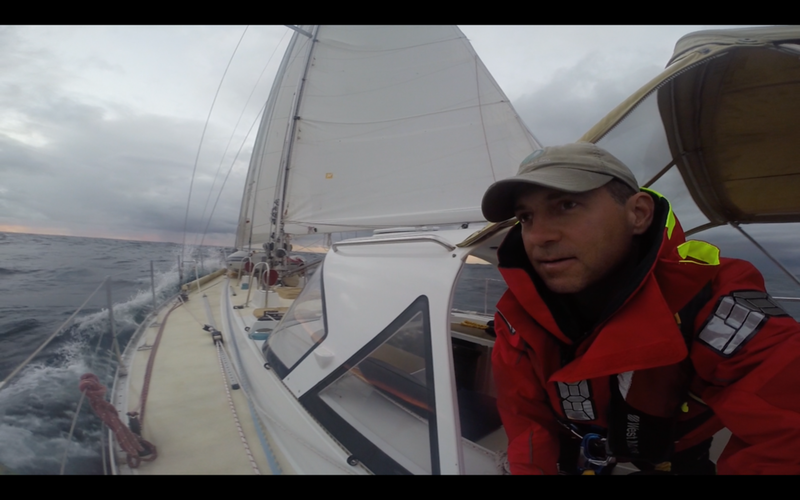 At 11:00pm, we pulled into Marsden Cove in calm seas, light wind, and nearly full moon. We slowly navigated the channel heading up-river to the marina, using the lighted channel markers as our guide. We pulled alongside the quarantine dock, secured the boat, and opened up potato chips and cold beers! We spent about a week at Marsden Cove Marina, cleaning the boat and making notes of things to repair. We also spent a lot of time eating and resting. We enjoyed the gracious company of our go-to Airbnb hosts Mike and Jennifer, and their dog Milly. After a week, we departed again and set sail for Auckland, about 100 miles south. We took our time getting there, anchoring at Kawau Island and Rangitoto Island for some day hikes and overnights. It was a fantastic experience to do some real "cruising" which is fun and relaxing. The long-haul passages across the ocean are much more serious business, almost more like work. So it was great to take a few days and just cruise around and enjoy the beautiful islands of New Zealand. Once in Auckland, I packed my bags and moved off the boat into a hotel. After a great crew dinner, and a day to recover, I headed home to San Francisco grateful for all of my amazing experiences aboard Avalon. Catching up on sleep in the quiet Marsden Cove Marina. 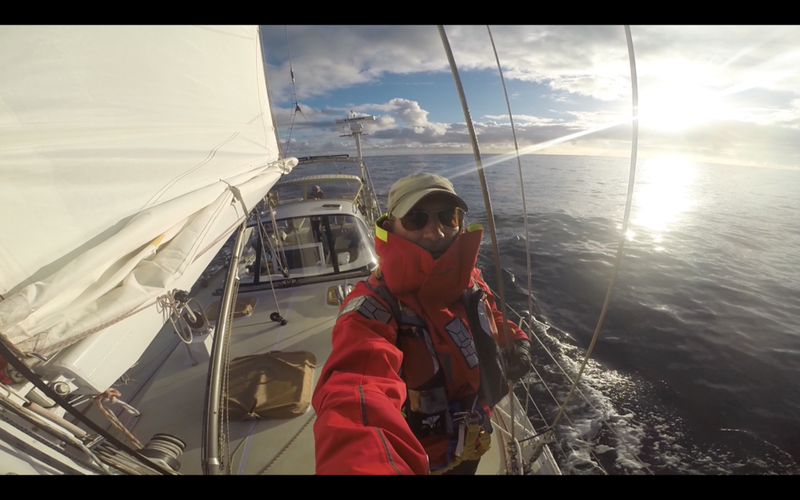 Enjoying the final stretch - motoring down the coast of New Zealand in light conditions. Just a quick update from Fiji before we set sail for New Zealand. 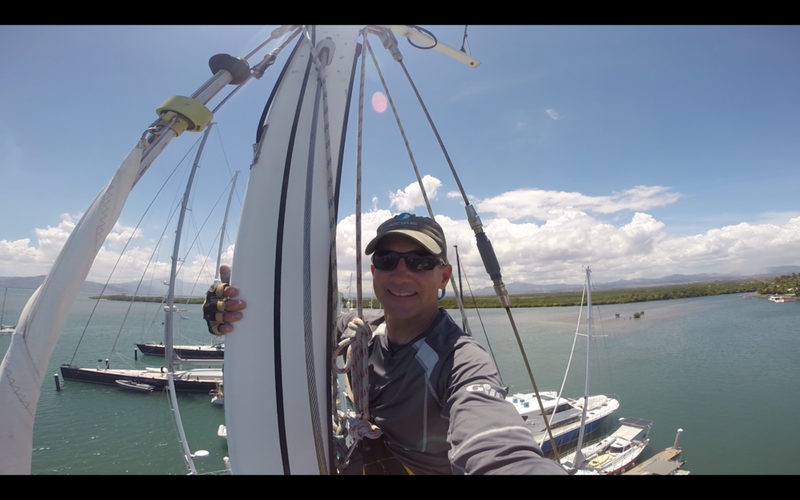 I flew into Fiji on October 21, where I immediately rendezvoused with Skipper Tom and fellow crew Di and Nikki. It was 7:00am, so we had a crew breakfast at our favorite spot, Rhum-Ba, overlooking Port Denarau Marina. After breakfast, we headed down to the boat, sailing vessel Avalon. She looked great! Tom and Di have been cruising Fiji this summer, so the boat was ship-shape. Nevertheless, we have spent the last week or so cleaning, organizing, testing, checking, planning, etc. We took Avalon out for a shakedown sail so that Nikki could familiarize herself (and I could re-familiarize myself) with this particular boat’s operations. Every boat is rigged differently and handles differently. Meanwhile, Skipper Tom has also been diligently watching the weather – working with multiple sources to identify a favorable weather window for our 1,200-mile sail to New Zealand. This is tough passage and weather forecasting is super important. We now seem to have a good window, and Skipper Tom has made the call: we depart this weekend! The exact time will depend on local conditions. Once we checkout with Fiji Customs, we have to make the tough transit through the outer reefs. We want to do that in light wind and daylight if possible. As always, I’m honored and thrilled to be part of this voyage. I’m filled with excitement and anticipation. We hope for the best during the passage; yet, we know we will face challenges along the way. As a 4-person team, alone in the open ocean, we will work through those challenges and figure it out. We’ll take care of Avalon and each other. That’s it for now. I have to be focused on the passage, not Facebook or website updates, so this will be my last post before New Zealand. I’m signing off and setting sail! SV Avalon. She's ready to go, and so are we! 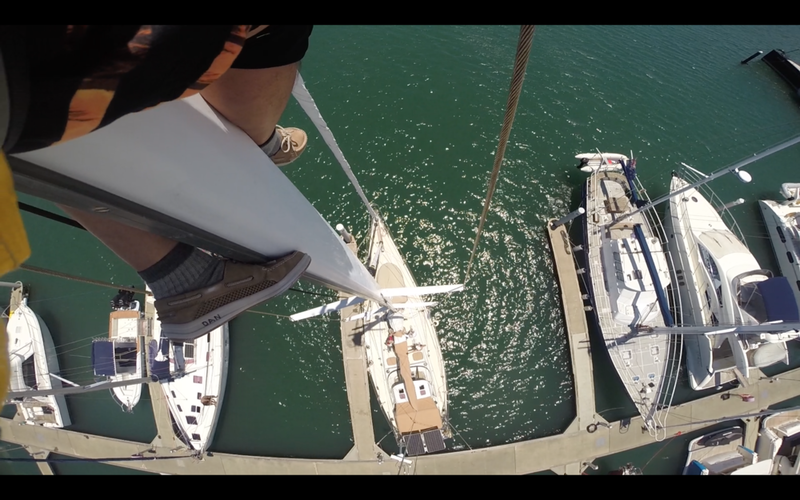 Up the mast! What a view! An evening at our favorite sunset bar, Travellers. Funny that each table has a dog. The last two nights before departure, I splurged and stayed at the Westin. 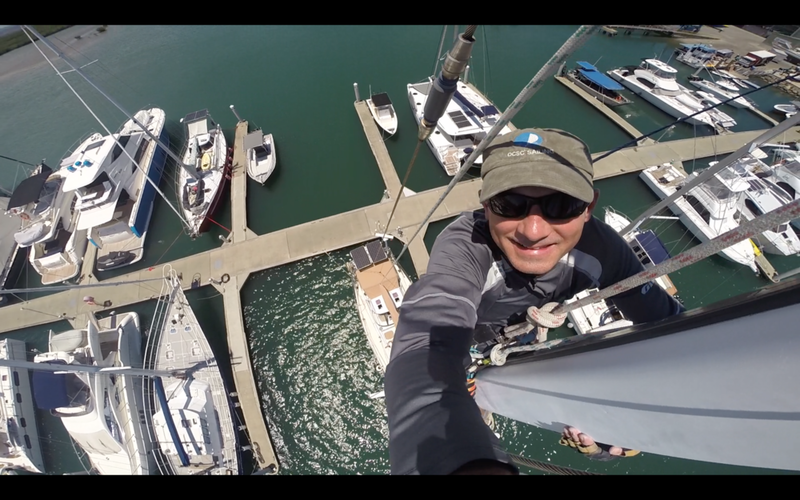 After three weeks of waiting for favorable weather, we finally departed Marsden Cove Marina, New Zealand, on Saturday, May 27. We gently backed out of the slip and slowly motored out of the marina. The gurgling purr of our vessel’s 75-horsepower engine was drowned out by our carefully-selected “departure soundtrack” blasting from the stereo, including hits like “Should I Stay or Should I Go.” We waved goodbye to onlookers as the three of us headed out to sea. We hoisted our sails as we passed Bream Head on our port side. When we were clear of the magnificent rocky point, we turned to port and headed north, hoping to sail as close to our rhumb line of 007T degrees as possible for the next 7-9 days. 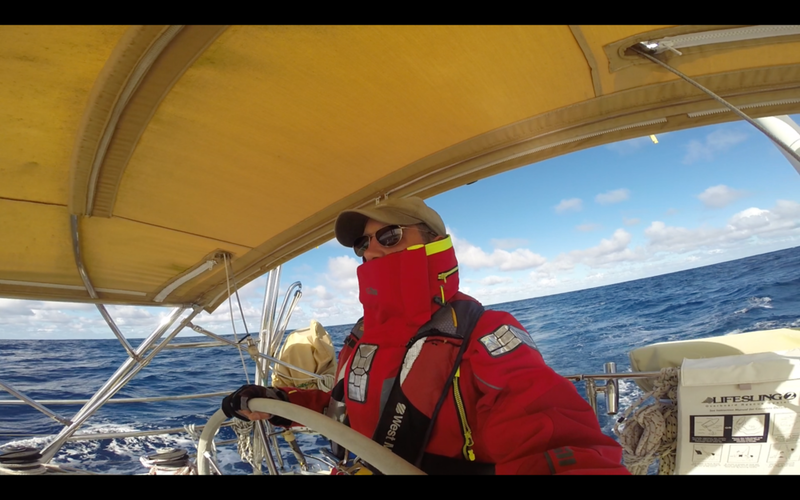 As we expected, a stiff breeze and heavy swells greeted us immediately, forcing us to put on our ‘sea legs’ quickly. We hunkered down and weathered the weather, establishing a routine watch schedule (e.g., 3 hours on, 6 hours off). We stayed hydrated and nibbled on simple things hot soup and pre-made sandwiches to stave off seasickness. Several other cruising boats left the same time we did. (The delay in good weather had created a bit of a back-log of cruisers waiting to head to the islands.) The first day or two it was fun to see the other boats off in the distance, either ahead, behind, or beside us. We passed a couple of boats, one in day time, one at night time, so that was a morale boost. As we sailed north, distances became greater, and we kept a close eye on AIS (an automated identification system that vessels at sea use to identify and avoid each other) to maintain safe distances. After two days, we’d made progress north and a bit east (to stay well clear of the New Zealand coastline, which could be treacherous if the wind shifted around to the east). We then encountered a high-pressure ridge that was sitting across the passage route, and brought blue skies, high wispy clouds… and no wind. We were becalmed! 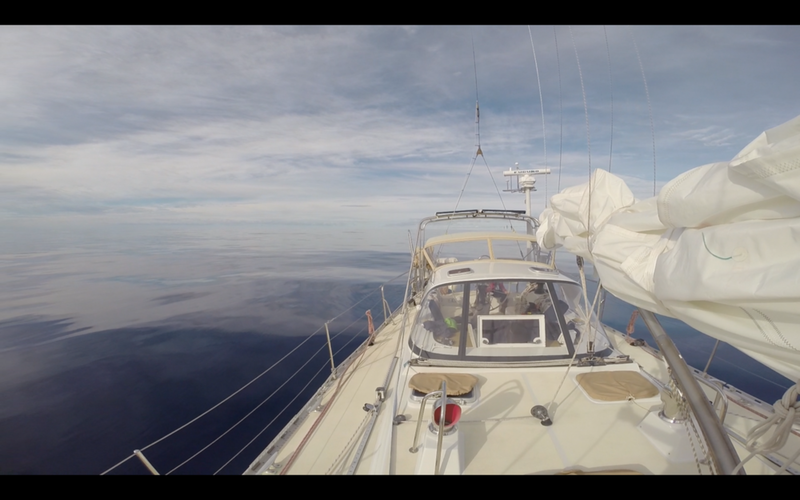 With absolutely no wind and perfectly glassy water, we dropped the sails and sat adrift for nearly two days. We played with light-air sail configurations, but also just enjoyed the amazing experience sitting hundreds of miles from anywhere. I was tempted to jump in the water and go for a swim, so that I could say I swam in the middle of the South Pacific Ocean, in over 10,000 feet of water. But I knew it was too dangerous; too many things might go wrong. We did use the calm-water opportunity to take showers on deck, hang laundry on the lifelines, and cook bacon in the oven! You may ask, "Why don't you just turn on the engine and motor?" Well, we only carry enough fuel to motor for about 700 nautical miles. The passage is over 1,000 nautical miles! So we have to be prudent on fuel usage - not just how much, but when. We need to make sure we have plenty of fuel for navigating the reefs in Fiji, for docking, and for emergency situations. Eventually, the wind picked up again – a lot – and it was blowing in the right direction! Delighted, we blasted toward Fiji with the southeast trade winds and rolling swells behind us. But then, we encountered another obstacle that caused us to deviate well off course. At 3:00 am on a dark, moonless night, I was on watch. I noticed string of bright lights appearing on the horizon, off both the port bow and starboard bow. Nothing showed up on AIS. But something was out there. Earlier in the week, we had heard reports that three other sailboats making this passage had gotten their propellers tangled up in fishing nets and lines. I woke the skipper. Possible danger ahead! Checking both radar and binoculars, we could see these lights were vessels of some sort. We hailed them on the VHF radio and, yes, it was a Japanese fishing fleet. In broken English, they informed us their fleet and equipment stretched across 38 nautical miles – directly in our path! We knew they weren’t about to haul in their nets to let us through (nor did they advise us of a safe heading to stay clear), so we had to make a drastic (and lengthy) change of course to protect ourselves. 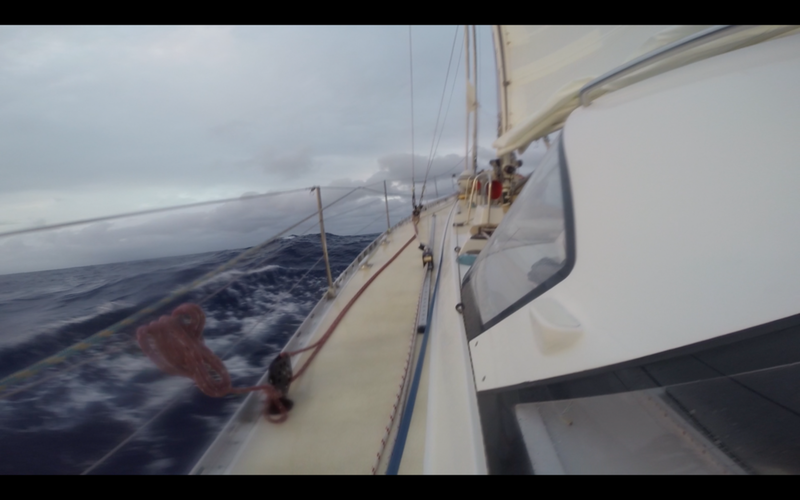 After the detour, we clawed our way back toward Fiji, dodging (or enduring) the occasional squall which brought with it heavy wind and rain. By Sunday, June 4, we finally arrived outside the shallow reefs of the island nation. At that point, though, it was nightfall, and the reef was too dangerous to navigate in the dark. We decided to “hold off” (kind of like pacing back and forth) and waited for morning light. 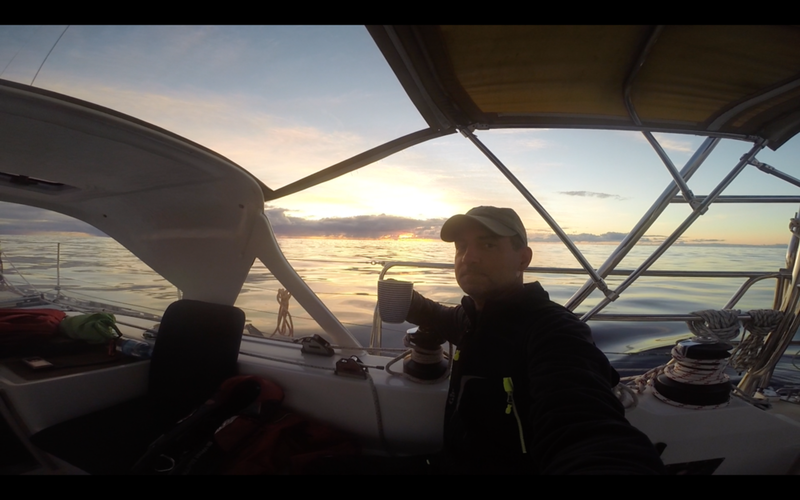 So under the rising sun on Monday, June 5, we motor-sailed through the narrow break in the reef and into Nadi Bay. We docked at Vuda Marina where we checked-in with customs and immigration. With paperwork done, we headed ashore. A cold beer and hot shower never felt so good! Thanks to skipper Tom and admiral Di for trusting me to help them make this passage! What a memorable and fun adventure, yet again! After a final weather check this morning, we've decided to cast off the dock lines and set sail today, headed 1,200 miles north to Fiji! I know that ocean sailing is not to be taken lightly. The ocean environment can be wild and unpredictable. It can foster feelings of loneliness, insignificance, and fear. And it certainly commands respect. Yet, at the same time, it provides an opportunity for us to be completely free, self-reliant, and totally surrounded by Nature. If we’re lucky, we might sail alongside a sunset bursting with color, or sail under the darkest of night skies accented with twinkling stars and a smiling moon, or sail with puffy white clouds racing us to the horizon. 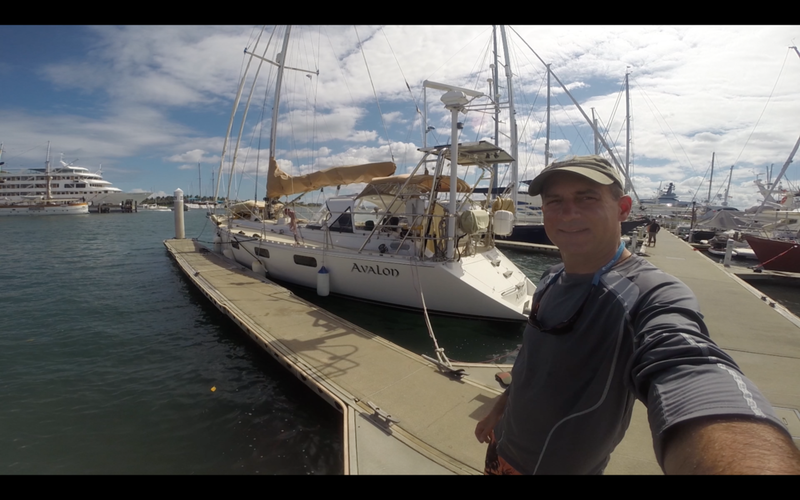 I’m thrilled to be back on board the sailing vessel Avalon, as we begin this adventure! If all goes well, we plan to arrive in Fiji in 7-8 days... but we are dependent on the wind and waves to help us! So long! The sailing vessel Avalon. She's a beauty! And fast!